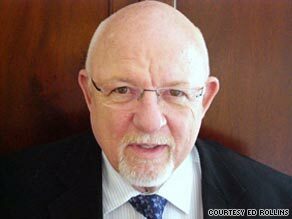 Ed Rollins says his daughter's generation may be burdened with an extraordinary amount of debt. (CNN) -- My 14-year-old daughter graduated earlier this week from middle school (8th grade) and she begins high school in the fall. As I watched her and her classmates receive their diplomas, I reflected on the world they are going to inherit from us. As with most fathers, there is nothing more important to me than my child. Lily is my only child and she blessedly came into my life as an infant by way of China. Like the children of many older fathers, she took on a disproportionate role in my consciousness. Because I became a father after my days as a Washington power player were over -- Lily never knew what I did and still doesn't, and couldn't care less -- she had no competition for my time and attention. But as she became my focus, she also became my barometer. I looked at the world through the eyes of my child. And planning for her future is all-important. As I look ahead four years to when Lily and her classmates will complete their high school education, we will have a much fuller picture of President Obama. By the time she graduates in June of 2013, the president will have either been re-elected or fallen by the wayside of defeated presidents. Today he looks invincible, but each day more challenges are stacked on his plate. Or, "Dad, how can you be a Republican?" I don't need to look at polls to know my party has a big challenge ahead and my old friend Newt Gingrich, smart as he may be, is not going to lead the next Republican revolution. I don't think Sarah Palin is either. But in four years, Iraq will either be a thriving democracy or engrossed in a raging civil war. Afghanistan may still be simmering . I hope American troops won't be there. I can only assume that Israel and Palestine will still be at the top of the agenda. Health care as we know it will be totally altered. The American auto industry might not be American, and I hope some stability will have come back to our banking and housing sectors. And waterboarding, torture and Guantanamo will not be subjects of discussion in our daily newspapers. Iran, Pakistan, North Korea -- and, I am afraid, terrorism -- will be. That is, if we still have daily newspapers. And the world Lily and her classmates will live in will be far different from the one they were born into just a few short years ago. Our nation is deeper in debt than at any time in the lives of these kids' parents since World War II. The national debt and uncontrolled government spending will have an impact on their lives and future opportunities. It will alter the country's choices. Entitlements may be a word of the past as they will live in a country of extraordinary high taxes and little for them. Right now, we as a nation owe $11.3 trillion and we are adding $3.85 billion a day to that burden. Every U.S. citizen, including my daughter and her classmates, owes over $37,000 as their share. Looking ahead at the next four years as she goes through high school, present government spending will add at least $1.2 trillion each year, and probably more. By the time she is out of college and into the workplace, the national debt will double. The president this week said he wanted to lower deficit spending and go back to "Pay as you go" rules, which means that for every new dollar of spending, you must save or cut a dollar of spending elsewhere. Good goal; but it never has worked before, and the law was allowed to lapse in 2002. So, Mr. President, whatever you want to do with health care or the other expensive programs you want to impose upon us, be honest with us on how you are going to pay for them. Let's start a policy of being honest about what programs are going to cost. And I want to be honest with you. We Republicans are responsible for a big chunk of the present debt. President Clinton left George W. Bush with a budget surplus. President Bush left President Obama with a deficit getting close to $2 trillion. President Bush and the Republican majorities in Congress were fiscally irresponsible and that certainly is a giant factor in why voters threw us out. The wars in Iraq and Afghanistan have cost thousands of precious American lives and nearly a trillion dollars in outlays and are a long way from being over. At the beginning, the only person who was honest about the cost of going to war was White House economic adviser Lawrence Lindsey, who offered an "upper bound" estimate of $100 billion to $200 billion in a September 2002 interview with The Wall Street Journal. In January 2003, then-Defense Secretary Donald Rumsfeld said the budget office had come up with "a number that's something under $50 billion." For his integrity, Lindsey was run off. And Rumsfeld was given the nation's highest civilian award, the Presidential Medal of Freedom. Beginning with his January 2003 State of the Union address, President Bush pledged to keep the total cost of the new Medicare drug benefit program to $400 billion over 10 years. It's cost at least double that -- and rising. As President Obama campaigned over the last two years, he developed his own version of the "I Have a Dream" speech. It offered hope and certainly a change from George W. Bush -- which was almost all that was necessary for victory. It certainly worked for the media that love him unabashedly. Now he's offering the world (or at least the Muslim world) the "Everyone can have a dream if we just love each other" speech. Dreams don't cost money and love shouldn't either. Government programs do. But in order to live that American dream, for my daughter and your daughters, Mr. President, you and the Congress have nothing but tough choices ahead.